Sunday Games 11am new members welcome. The Easter Major took place on Good Friday in perfect golfing conditions warm and sunny with little to no breeze. Some really good scoring on the day with the winner Alan Carroll slotting in seven birdies to take the prize by three strokes from Breda Finnegan on Net 52, just etching out Noel Dunne [ob9]. Nearest the pin on the day went to Noel Dunne. Wednesday Pairs Scramble winners were Noel Dunne & Bernie O’Driscoll G45[0b9] from R/up Ronnie Delaney & Josie Cahill. Lotto Bonus Balls for April available from the clubhouse. Sunday game winner Steven Rowe Net 46, R/up Alan Carroll net 52. Wednesday threeball 27 hole winners Ronnie Delaney & Breda Finnegan G69. R/up Tommy McCann, Gerry Shanahan & Marie Delaney G71. Easter Major Good Friday Tee 4pm. Sunday game winner Nick Savage net 51[ob9] from R/up Jason Doyle. Wednesday three ball scramble is at 4pm. A very happy mothers day to all our ladies. Sunday game winner Noel Dunne Net 48, R/up John Fitzpatrick net 50. The Wednesday scramble returns this week Wed 3rd April at 4pm. The LOTTO bonus ball has returned for April and available at the club. Sunday game winner Noel Dunne net 53[ob9] from Seamus Dunphy. Congratulations to Jimmy Browne with a hole in one on the 6th. Next Sunday starts the birdies competition to fill the nine holes. Scramble returns on Wed 3rd April 4pm this great for new members to take up the game and play in a team of three. A very happy St Patrick’s day to everyone as we had our first club major of 2019 on the feast of our patron Saint. O’Connor Cup winner Ronnie Delaney net 51[ob9] from R/up Tommy McCann. Congratulations to Tommy with his nearest the pin on the day 6’’. Also congratulations to Seamus Dunphy with a hole in one on the 6th. The LOTTO bonus ball return has been deferred until April. A very wintery start to the morning with blustery gale force westerly winds brining a small snow shower before we played which made conditions very challenging. After the shower cleared we had bright sunshine for the morning with the wind really testing the play all morning. Sunday game winner, Josie Cahill net 46, R/up Nick Savage Net 51 a great score from Josie in very windy conditions. Next week Sun 17th March is the O’Connor Cup tee 11am. The LOTTO bonus ball has returned for 2019 and balls are available from the clubhouse. Deepest sympathies to the Rogers family on the recent loss of their dear dad & husband Joe may he RIP. Sunday game winner Alan Carroll Net 50 [0b9] from John Fitzpatrick. Congratulations to Alan with a hole in one straight out of the sky on the 6th. Sunday game winner Steven Rowe Net 45, R/up John Fitzpatrick Net 48. Two great scorecards on a blustery morning but with the winner managing to keep bogies off the card resulting in a great round. Sunday games continue each week at 11am and new members are very welcome to come along to try it out. Great spring weather and a good time to take up the game of P&P new members are very welcome please check for info on our website or come along to a game on Sunday morning tee time 11am. Sunday game winner Bernie O’Driscoll Net 50, R/up Seamus Dunphy net 51. Congratulations to Paddy McDentt with a hole in one on the 7th. New members welcome Sunday games take place at 11am each week. Sunday pairs winners Ronnie Delaney & Breda Fimnegan G48[ob9] from Nick Savage & Tommy McCann. Congratulations to Breda Finnegan with the first hole in one for 2019 on the 1st hole and Rory Homan with his Ace on the 4th a great start to the new year. Deepest sympathies to the Gannon family on the recent loss of their dear dad, husband and club patron Sean may he RIP. Sunday three ball winners Alan Carroll, Paddy McDentt & Bernie O’Driscoll G45. R/up Rory Homan, Tommy McCann & Trish Cox G48. Sunday games continue weekly at 11am. A very happy peaceful and sporting new year to all our members and supporters. The club will resume adult games next Sunday 20th January at 11am. We are enjoying a great spell of good dry weather at the moment and it is allowing the ground to recover from the heavy wetting at the end of 2018. The final turkey game for 2018 was a three ball scramble that produced some very close scores on the day. Winners of the 3 ball 27 hole turkey scramble, Martin Cullen, Seamus Dunphy & Bernie O’Driscoll G69, R/up Noel Dunne & Trish Cox G70[ob9] from Ronnie Delaney & Jason Doyle. Congratulations to Mary Kennedy with a hole in one on the 3rd to win the nearest the pin on the day. A very happy Christmas to all the members and supporters of the club and a peaceful new year. To get more info about the club please check our website www.ballyboughalpitchandputt.com call the secretary on 085-1743748 or come along on Sunday morning 11am before the game. Christmas turkey pairs winners Ronnie Delaney & Seamus Dunphy G46, R/up Noel Dunne & Jason Doyle G47. Next week Sun 9th Dec 11am final turkey game will be a 3ball scramble and all the Christmas prizes will be given out all members welcome. Sunday game Turkey scramble winner Noel Dunne G46, R/up Martin Cullen & Mary Kennedy G46. Congratulations to Josie Cahill with a hole in one on the 1st. Congratulations to the 2018 winner of the George McDonnell memorial Cup Martin Cullen by one stroke from R/up Seamus Dunphy, in 3rd place was Jason Doyle [0b9]count. Well done to Bridget Murray on winning the final game with a seven under par 47 [ob9] from Gerry Shanahan. Also Congratulations to Bridget with a hole in one on the 5th. Our player of the year award goes to Alan Carroll after a great season score of 48 thus securing the win by a seven point victory from nearest rival Ronnie Delaney. Top Lady player of the year was Trish Cox. Sunday Turkey winners Noel Dunne & Tommy McCann G46. Deepest sympathies to the Farrelly family on the recent loss of their dear sister Breda Ballyboughal & USA RIP. The 4th round of the George McDonnell Memorial Cup at Malahide was won by Nick Savage Net49, R/up was Martin Cullen net 50[ob6] from Bernie O’Driscoll. The final round in the McDonnell Cup will be played at home next Sat 10th Nov Tee 2pm. Sunday Xmas turkey winner Alan Carroll net46, R/up Jason Doyle net 47. Congratulations to Alan with a hole in one on the 16th. The 3rd round in the George McDonnell memorial cup was played at the Brock Inn on an arctic cold day with the course in magnificent condition this produced some very close scores on the day. The 3rd round winner was Seamus Dunphy Net 49, R/up Jason Doyle Net 52. Congratulations to Ronnie Delaney with a hole in one on the 11th. The next round in the George McDonnell cup takes place next Sat 3rd Nov in Malahide castle Tee 2pm. Wednesday scramble winners Martin Cullen & Trish Cox G49. The Wednesday scramble has now finished for the winter to be resumed in February 2019. Sundays Xmas turkey winner Joan Homan Net 51, R/up Josie Cahill Net 52. Ladies Cup 2018 winner Joan Homan Net 51, R/up Josie Cahill Net 52. Congratulations to Bernie O’Driscoll nearest the pin on the 3rd. October LOTTO Bonus Ball winner #36 Gerry Shanahan, Plus1 #23 Marie Delaney, Plus2 #27 Rory Homan. Deepest sympathies to the Ryan Family on the passing of a dear husband, dad and grandad Aidan R.I.P. The second round in the George McDonnell Memorial Cup took place in Ratoath on a near perfect autumn Saturday afternoon. The second round winner was Gerry Shanahan Net 50, [ob9] from Eddie Madden. Congratulations to Seamus Dunphy with a hole in one on the 9th. The next game in the McDonnell Cup takes place next Sat 27th Oct at the Brock Inn Tee 3.30pm. Wednesday scramble winners Martin Cullen, Gerry Shanahan & Paddy McDentt G41 a great round of 13 birdies. Sunday game winner taking the first Turkey was Ronnie Delaney Net49, R/up John Fitzpatrick net 51. Turkey games continue every Sunday morning until Dec weather permitting visitors welcome. LOTTO bonus balls available for October this is the last lotto for 2018 many thanks for all who supported us over the year. The first round of the George McDonnell Memorial Cup was won by Alan Carroll with a fantastic Gross 45 which included a hole in one on the 9th, R/up Kieran Warren with a Net 48. The second round in the McDonnell Cup takes place next Saturday 20th October in Ratoath Tee 3.30pm. Wednesday scramble winners Ronnie Delaney & Josie Cahill G45. Sunday game winner Tommy McCann Net48, R/up Seamus Dunphy net 49. Wednesday scramble winners Tommy McCann, Rory Homan & Bridget Murray G47 [ob9]. Congratulations to Bridget Murray with a hole in one on the 9th. Ladies Cup next Saturday 13th Oct 4pm. The first round game in the McDonnell Cup takes place next Sunday Morning 11am. The 2018 Club Championship winner Martin Cullen -14, R/up Rory Homan -5. Congratulations to Joan Homan nearest the pin on the final day. After three weeks play Martin Cullen held on well to his lead to secure the Jones Cup for the 1st time. Wednesday Scramble winners Ronnie Delaney, Marie Delaney and Trish Cox G45. September LOTTO bonus Ball winner Gerry Shanahan #33, Plus1 Nick Savage #39 ,Plus2 Seamus Dunphy #8. The final of the Ladies Pearl Grogan Cup was a close run competitive game with winning pair taking the prize on a back nine count. Pearl Grogan Cup winners Joan Homan & Maureen O’Neill G52[ob9] R/up Bridget Murray & Maureen Flemming. Club Championship Jones Cup 2nd Round Leader Martin Cullen -11 with Tommy McCann -3. Check the website www.ballyboughalpitchandputt.com for the full Leader-board listing. The concluding game and final is next Sunday 30th Sept 11am. Wednesday scramble winners Alan Carroll, Eddie Madden & Trish Cox G47. The Wednesday scramble is now at 4pm. September LOTTO Bonus balls are available at the club. Club Championship 1st round leaders Martin Cullen & Tommy McCann -3under par. The second round is next Sunday morning 11am. Wednesday scramble winners Alan Carroll, Tommy McCann & Bridget Murray G45. The scramble on Wednesdays will be at the new time of 4pm. The ladies Pearl Grogan Cup final is next Saturday 22nd Sept Tee 4pm. Deepest sympathies to the Masterson family on the passing of their dear dad Noel RIP. Winner Sunday 2nd Sept Seamus Dunphy Net 50 [ob9], R/up Breda Finnegan. Wednesday scramble winners Tommy McCann, Nick Savage & Gerry Shanahan. Sunday game winner 9th Sept Tommy McCann Net 48, R/up Rory Homan Net 50. The Club Championship Jones Cup 2018 starting next Sunday morning 11am will be over three games Sun 16th/23rd and the Final on the 30th. Two best cards to count. The 2nd round of the Ladies Pearl Grogan team scramble next Saturday at 4pm. The regular weekly games are on Sunday mornings at 11am and Wednesdays at 6.30pm new members very welcome to come along and play. To get more info about the club please check our website www.ballyboughalpitchandputt.com call the secretary on 085-1743748 or come along on Sunday or Wed before the game. Well done to the Club Team who won the Fingal & East Meath Championship last Friday evening. In a thrilling final round of games where Ballyboughal needed 1.5 points to guarantee victory we finished up winning two and a half from four to secure victory. Team captain Tommy McCann accepted the cup from Catriona Geraghty the sports development officer with Fingal Co Co who have supported this competition over the past four years. Many thanks to Ring Common who hosted the final games and hospitality and Gladstone Skerries 2017 winners for competing in the competition. The Bartle Maxwell Shield men’s singles winner Seamus Dunphy Net 48, R/up top gross Ronnie Delaney G50. Well done to Martin Cullen with two hole in ones, one on the 7th on Wed in Ballyboughal and one on the 16th in Ring Common in the Fingal Cup Final. Wednesday scramble winners Noel Dunne, Brian Delaney and Rory Homan. August LOTTO Bonus ball winner #36 Gerry Shanahan, Plus1# 18 Richie Sommervill, Plus2 #46 Cooney Gang. Best wishes to Ballyboughal Ladies Football team in their Championship final on Wed evening 8.30pm in Fingallians Swords. **Latest News** Congratulations to the Club on winning the Fingal & East Meath Club Championship. Sunday game winner Kieran Warren Net 49,R/up Alan Carroll Net 50[ob9] Congratulations to Gerry Levins from Gladstone with a hole in one on the 4th. Wednesday Scramble winners Rory Homan, Nick Savage and Bridget Murray. The Bartle Maxwell Shield (Gents only) takes place next Thursday evening 23rd Aug Tee 7pm. The final round of games in the Fingal and East Meath Championship takes place next Friday evening 24th Aug at Ring Common Sports Centre Naul. Tee 6 -6.30pm. All teams taking part to be there for 6pm for the draw. August LOTTO bonus balls available. Sunday game winner Alan Carroll Net 49, R/up Nick Savage Net 50[ob9] Congratulations to Mary Kennedy with a hole in one on the 10th. Wednesday scramble winners Noel Dunne, Gerry Shanahan and Marie Delaney. The scramble game this week moves to Thursday evening 16th at 7pm due to the Blessing of the graves in Ballyboughal on Wed evening 15th. The second round of the Fingal and East Meath Championship next Friday evening 17th Aug at Ring Common Sports Centre Naul. Tee 6 -6.30pm. All teams taking part to be there for 6pm for the draw. Wednesday scramble winners, Noel Dunne & Bridget Murray, R/up Martin Cullen & Nick Savage. The Fingal and East Meath Championship starting next Friday evening 10th Aug at Ballyboughal with Ring Common (A&B), Ballyboughal and reigning Champions Gladstone Skerries taking part Tee 6 -6.30pm. The regular weekly games are on Sunday mornings at 11am and Wednesdays at 7pm new members very welcome to come along and play. To get more info about the club please check our website www.ballyboughalpitchandputt.com call the secretary on 085-1743748 or come along on Sunday or Wed before the game. The annual Walker Cup par3 golf scramble was won by Noel Dunne, Nick Savage & Nick Mulvany G57, R/up Alan Carroll, Tommy McCann & John Fitzpatrick G58. Sunday singles winner Eddie Madden Net 51, R/up Mary O‘Sullivan Net 52. July Lotto Bonus ball winners, #5 Josie Cahill, Plu1 #29 Steven Rowe, Plus2 #12 Maura Lynch. Congratulations to the 2018 Club league winners Team C: Jimmy Browne, Tommy McCann, Mary Kennedy & Mary O’Sullivan. R/up Team A: Martin Cullen, Gerry Shanahan, Marie Delaney & Josie Cahill. Sunday game winner Ronnie Delaney Net 48, R/up Joan Homan Net 51. Congratulations to Alan Carroll with a hole in one on the 4th. The annual Walker Cup Par3 golf 3ball scramble takes place on Wed 25th July at the Balheary par3 golf club, Tee 6pm, visitors welcome contact Ronnie on 085-1743748. July LOTTO bonus balls available. Sunday game winner Eddie Madden Net 49, R/up Mary O’Sullivan Net 50. Sunday 18th July winner Tommy McCann Net 49, R/up Joan Homan Net 50. Club league concludes on next Wed 18th July 7pm. The annual Walker Cup Par3 golf 3ball scramble takes place on Wed 25th July in the Balheary par3 golf club, Tee 7pm, visitors welcome contact Ronnie on 085-1743748. We will all remember the summer of 2018, long time coming but well worth the wait as we bask in medeteranian conditions for the past few weeks hopefully it will continue over July and August also. Sunday game winner Breda Finnegan Net 53[ob6] R/up Alan Carroll. Club league Wednesday winners Martin Cullen & Gerry Shanahan. June LOTTO bonus ball winners #46 Anne Ryan, Plus1 #5 Kieran Warren & Plus2 #34 Mary Dunphy. Great weather is still with us and conditions all week and at the weekend were perfect for playing Pitch & Putt. Wednesday league winners Tommy McCann & Mary Kennedy Net 45, R/up Josie Cahill & Marie Delaney Net 46 the third week of league games continue next Wed.
Away day scramble to Juliananstown winners Martin Cullen, Brian Delaney & Trish Cox G49[ob9] from Eddie Madden Tommy McCann & Bridget Murray. Sunday singles winner Jason Doyle Net 51[oF6] R/up Steven Rowe. LOTTO Bonus balls available for June draw next Sat. Sunday game winner Mary O’Sullivan Net 51 [ob9], R/up Tommy McCann. The Wednesday club league continues next week. Lotto Bonus balls available for June. Away day to Julianstown next Saturday 23rd June Tee is 2pm if anyone needs a lift meet at the clubhouse at 1.30pm. 2018 Membership closing date is the end of June. With the country basking in some of the best sunshine we have ever had it was perfect conditions for golf with almost no wind to contend with. The Jack Fitzsimons cup produced a very close game apart from the winner Nick Savage who produced a brilliant back nine to take the cup with a six under par Net 48. Four players tied on two under par and Seamus Dunphy took this prize on the back nine count. Jack Fitzsimons Cup winner Nick Savage Net 48, R/up Seamus Dunphy Net 52. Wednesday scramble winners Tommy Mc Cann & Mary Kennedy R/up Eddie Madden & Trish Cox. Sunday game winner Rory Homan Net 53, R/up Kieran Warren Net 54. Wednesday scramble winners Ronnie Delaney & Tommy McCann G70. Next Wed starts the summer league team draw takes place befor the game on Wed 6th June. Congratulations to Seamus Dunphy with his first singles win net 53, R/up Mary Kennedy Net 54. 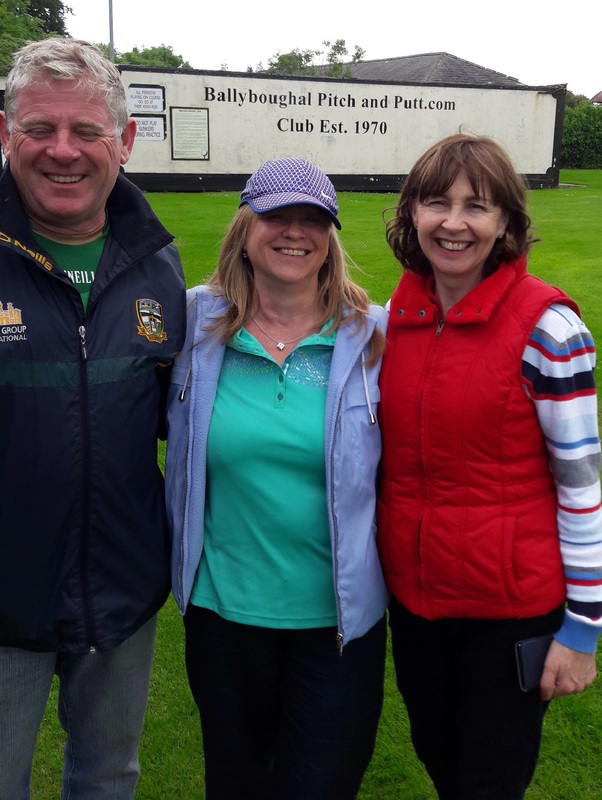 Wednesday scramble winners Noel Dunne, Bridget Murray & Marie Delaney G64 a great round with a hole in one on the 16th For Noel Dunne and one on the 18th for Bridget Murray. The next club major is the Jack Fitzsimons prize on Sunday 10th June. Sunday game winner Martin Cullen Net 51, R/up Bridget Murray net 54[ob6]count after four way tie. Wednesday scramble winners Noe Dunne, Jason Doyle & Bridget Murray. May LOTTO Bonus balls available. Deepest sympathies to the Farrelly family on the recent bereavement of John (Sean) Farrelly in Australia a founding member of the Club may he RIP. The 3rd club major of 2018 the Mulvany Cup played in excellent weather conditions produced a very close battle on the day. With four players tied on 2 under par the winner and runner up cam home just one stroke better than each other in a very close game. Mulvany cup winner Alan Carroll net 49, R/up Mary O’Sullivan Net 50. Congratulations to Trish Cox with the nearest the pin on the day. Wednesday scramble winners Eddie Madden, Nick Savage & Bridget Murray. Sunday game winner Trish Cox Net 48, R/up Mary O’Sullivan net 49. Congratulations to Trish with a hole in one on the 10th. Wednesday scramble winners, Noel Dunne, Paddy McDentt and Trish Cox. The Wednesday scramble returns to the evening time of 7pm from Wed 9th May.b please check our website www.ballyboughalpitchandputt.com call the secretary on 085-1743748 or come along on Sunday or Wed before the game. Wednesday scramble winners Alan Carroll, Eddie Madden & Marie Delaney. April Lotto bonus ball winners, Mary O’Sullivan #13, Plus1 Mary Kennedy #3, Plus2 Ann Ryan #40. The regular weekly games are on Sunday mornings at 11am and Wednesdays at 4pm new members very welcome to come along and play. To get more info about the club please check our website www.ballyboughalpitchandputt.com call the secretary on 085-1743748 or come along on Sunday or Wed before the game. Sunday game winner Noel Dunne net49, R/up Ronnie Delaney net 52. Wednesday scramble winners, Alan Carroll, Nick Savage & Paddy McDentt. LOTTO bonus balls available for April. It felt like summer has arrived at the Pitch n Putt this morning as we basked in great sunshine and near no wind a very welcome reprieve from the wintry weather since the start of the year. Sunday game winner Rory Homan Net 47, R/up Mary O’Sullivan Net 49. Congratulations to James Carroll from the Gladstone club with a hole in one on the 9th. The Wednesday scramble returns this Wed 11th April Tee 4pm. The 2018 LOTTO Bonus ball returns and is available at the clubhouse on Sunday mornings or call the secretary on 085-1743748. Easter Major winners 27hole scramble, Noel Dunne, Nick Savage & Jason Doyle G67, R/up Alan Carroll, Tommy McCann & Paddy McDentt G68. Nearest to the pin on the 8th Eddie Madden. The regular weekly game is on Sunday mornings at 11am new members very welcome to come along and play. To get more info about the club please check our website www.ballyboughalpitchandputt.com call the secretary on 085-1743748 or come along on Sunday morning before the game. The O’Connor Cup produced one of the great rounds of Pitch n Putt that only come round once in a while. With near perfect conditions a great morning to be having a game there were several very close cards but for the outstanding round from this year’s winner Noel Dunne. After shooting a back nine of six under par Noel finished up with a winning score of Net 43 after holing 12 birdies with only one blemish on the card. O’Connor cup Result Winner Noel Dunne Net 43, R/up Alan Carroll Net 50 [ob9] from Mary Kennedy. Nearest the pin on the day was Bridget Murray. Congratulations to Gerry Levins with a hole in one on the 1st hole. Next Friday 3oth March, is the Easter Major Tee 4pm, kindly sponsored by Gerrardstown Stud. Happy mothers days to all the mammies in the club. Sunday game winner Ronnie Delaney Net 49, R/up Martin Cullen Net 50[ob9]. Next week on Sunday 18th March is the 1st club Major of 2018 the O’Connor Cup. Deepest sympathies to Noel Dunne and family on the recent loss of their dear sister Pamella may she RIP. No game this week as the course was closed due to the heavy snowfall mid-week brought in by storm Emma. The biggest fall of snow since 1947 even surpasses the 1982 blizzards. But as the rain approaches hopefully spring can get going now and we may get some settled weather and enjoy March. If its any consolation the old saying comes to mind, March, ‘in like a lion and out like a lamb’’. Next week starts the 2018 player’s championship. Points are awarded for the weekly Sunday game with 3 points for a win, 2 points for r/up and one point for a top ten finish. Coming up on Sunday 18th March is the 1st club Major of 2018 the O’Connor Cup. This week’s Sunday game winner Noel Dunne net 48, r/up Seamus Dunphy net 51. On a chilly bright windy Sunday morning. Next week starts the 2018 players championship. Points are awarded for the weekly Sunday game with 3 points for a win, 2 points for r/up and one point for a top ten finish. Sunday game winner Ronnie Delaney net 49, R/up Alan Carroll Net 50. The 2018 players championship starts on Sun 4th March when points will be awarded for top ten placing in a Sunday game. The first club major of the year the O’Connor Cup takes place on Sun 18th March 11am. On a bitter cold day as very high winds swirled the course the day would bring some sunshine but making birdies was a challenge on this morning. Putting in a great round with four birdies on the card Mary Kennedy took the prize with a Net 49, closly followed by Martin Cullen two back on 51. Congratulations to Richie Sommerville from the Skerries group who had two aces on the morning one on the 9th and one on the 14th. The weekly game is on Sunday mornings at 11am new members very welcome to come along and play. To get more info about the club please check our website www.ballyboughalpitchandputt.com call the secretary on 085-1743748 or come along on Sunday morning before the game. Sunday game winner Jason Doyle net 47, R/up Noel Dunne Net 49. Congratulations to Jason on this his first singles win. Weekly game is on Sunday mornings at 11am new members very welcome to come along and play. To get more info about the club please check our website www.ballyboughalpitchandputt.com call the secretary on 085-1743748 or come along on Sunday morning before the game. Sunday game 27hole scramble winners, Martin Cullen, Nick Savage & Seamus Dunphy G70. Some great scoring for the first day after the Xmas break with three pairs in contention for a first win of 2018. With Alan Carroll and Mary Kennedy in the clubhouse on G48 it look a great score given the playing conditions. Alas the 2017 player of the year Bridget Murray partnering Noel Dunne came up trumps with three great birdies on the last three holes to take the game with a G44 two stroke better than Ronnie Delaney G46 after having a hole in one on the 5th. Sunday morning Turkey winners Alan Carroll & Seamus Dunphy Net 49. Nearest the pin on 4th Martin Cullen. Congratulations to Jimmy Browne with a hole in one on the 6th. We wish all our members and community in Ballyboughal a very happy and peaceful Christmas and prosperous New Year. The annual Carol service is on Next Wed 13th Dec at 8pm in the church of the assumption Ballyboughal. Sunday morning Turkey winners Nick Savage & Breda Finnegan Net49. Nearest the Pin on 4th Alan Carroll. Next Sunday 10th Dec will be the last Turkey game visitors welcome just contact the secretary for details. Any persons interested in playing P&P can contact the secretary on 085-1743748. Sunday morning Turkey winners Alan Carroll & Bridget Murray Net 47. Nearest the pin on the 8th Ronnie Delaney. Xmas Turkey pairs Sunday mornings at 11am visitors welcome just contact the secretary for details. Commiserations but a very well done to our village footballers Ballyboughal Rangers who fought a great sporting battle in the Leinster Intermediate Gaelic Football Final at Wexford Park over the weekend. Sunday morning turkey winners Ronnie Delaney & Mary O’Sullivan G46[ob9] from Nick Savage & John Cox. Nearest the pin on the 3rd Alan Carroll. Wednesday scramble winners Noel Dunne & Paddy McDentt. First Christmas Turkey winner Steven Rowe Net 53, R/up Mary Kennedy net 54. Xmas Turkey pairs from next Sunday 19th Nov 11am visitors welcome just contact the secretary for details. The winner of the 2017 George McDonnell Cup is Bridget Murray over 54holes Bridget took the prize by 3 strokes form R/up Mary Kennedy [ob9] from Eddie Madden in 3rd place. This is the last club major of 2017 and the final competition of the player of the year who this year is Bridget Murray edging out Nick Savage by the smallest margin of 1 point. Congratulations to Bridget on her achievements in 2017. The final round game in the McDonnell Cup at home was won by Martin Cullen Net50, R/up Mary Kennedy Net52. The Wednesday scramble winners Eddie Madden, Joan Homan & Josie Cahill. George McDonnell Cup 4th Round winner Bridget Murray net 47, R/up Mary Kennedy net 52. The final of the McDonnell Cup takes place next Sat 4th Nov Tee 2pm. Sunday game winner John Fitzpatrick net 49[ob9] R/up Rory Homan. Wednesday scramble winners Ronnie Delaney & Nick Mulvaney. Wed scramble is at 2pm next week. October Lotto bonus ball winner Kieran Warren #5, Plus1 Ronnie Delaney #19, Plus2 Eddie Madden #20. Many thanks to all our supporters of the monthly Bonus, ball which will resume in March 2018. The annual end of year night out takes place Next Saturday 4th November in the Carnegie Court Hotel Swords please contact the secretary for more details. Sunday game winner Kieran Warren Net 48, R/up Eddie Madden Net 51. Wednesday scramble winners Eddie Madden, Nick Savage & Nick Mulvaney. The 4th Round of the George McDonnell Cup takes place next Sat 28th Oct at home Tee 3.30pm. Autumn scramble games Wed’s at 3.30pm. The annual end of year night out takes place on Saturday 4th November in the Carnegie Court Hotel Swords please contact the secretary for more details. The George McDonnell Cup 3rd round at Ratoath Winner_Noel Dunne Net 53[ob9] R/up Eddie Madden. Bartle Maxwell Shield winner Jimmy Browne Net47, R/up Ronnie Delaney G46. Nearest the pin Steven Rowe. Congratulations to Ronnie Delaney with a hole in one on the 7th. The 4th Round of the George McDonnell Cup takes place next Sat 21st Oct at home Tee 3.30pm. The club committee and members wish to congratulate one of our founding members Mick Connell on his landmark recent 90th Birthday. Sunday game winner Nick Savage Net 48, R/up Eddie Madden Net 49. Wednesday scramble winners, Noel Dunne, Nick Savage & Kieran Warren. Third round of the George McDonnell Cup Saturday 14th Oct at Ratoath Tee 3.30pm. Gents only the Bartle Maxwell Shield is Sunday 15th Oct Tee11am. Ladies Cup sponsored by Bill & Peg O’Neill also Sun 15th Oct Tee 3pm. Sunday game winner Bridget Murray Net 51. R/up Nick Savage & Eddie Madden Net 52 tied after back counts. McDonnell Cup 2nd Round at Malahide winner Gerry Shanahan Net 50, R/up Bridget Murray Net 54 [ob6]. The next round in the George McDonnell Cup takes place in Ratoath Saturday 14th Oct Tee 3.30pm. Sept LOTTO bonus ball #10 Not sold club, Plus1 #44 Nigel Griffen, Plus2 #40 Not sold club. Wednesday scramble is at the autumn time of 3.30pm. Jones Cup, Club Championship Final winner Joan Homan, R/up Nick Savage and nearest the pin on the day was Noel Dunne. The 2017 Ladies Pitch and Putt League final took place after four weeks of round games five teams contested to give a very close contest on the final evening. Winners of the Ladies League Pearl Grogan Cup team event Bridget Murray, Marie Delaney and Ann Boylan. R/up Joan Homan, Pauline Gargan & Patricia O’Toole. McDonnell Cup 2nd round takes place next Sat 30th Sept at 3.30pm in Malahide. Sept LOTTO bonus ball draw next Sat 30th Sept balls available at the club. The final of the Club Championship Jones Cup is next Sunday 24th Sept 11am. Sunday game winner Joan Homan Net 47, R/up Josie Cahill Net 49 [ob9]. Scramble winners Noel Dunne & Patricia Delaney. Ladies League Pearl Grogan Cup final tonight Tues 19th Sept Tee 6pm. The first round of the Club Championship Jones Cup took place the second round is next Sun 17th and the final will be Sun 24th. The best two cards to count to include the final game. Sunday game winner Joan Homan Net 51, R/up Steven Rowe Net 52[ob9]. Scramble winners Noel Dunne, Joan Homan & Patricia Delaney. Ladies League Pearl Grogan Cup final next Tues 19th Sept 6pm. Well done to Ballyboughal Ladies football team with their Championship win over Ranelagh. Congratulations to the Gladstone Skerries with their win over Ballyboughal in the Final of the Fingal & East Meath Championship. Well done to Eddie Madden with a hole in one in the final. Scramble winners Tommy McCann, Rory Homan & Marie Delaney. Ladies Pearl Grogan League Tuesdays at 6pm. Best wishes to Ballyboughal’s ladies football team in the championship final next Friday. Pairs scramble winners Nick Savage & Trish Cox G45, R/up Rory Homan & Mary O’Sullivan. Congratulations to Jimmy Browne & Ronnie Delaney with a hole in ones on the 6th and 5th holes. August LOTTO Bonus ball winners #5 John Travers, Plus1 #20 Shaybo & Plus2 #45 Cooney Gang. Best wishes to Gladstone Skerries and Ballyboughal in the final of the 2017 Fingal & East Meath P&P championship next Sat Tee 4pm venue is Ballyboughal P&P club. Midweek evening games now at 6pm. Deepest sympathy to club member Seamus Dunphy and family on the recent passing of their dear mother Betty (Nee Sayers) may she RIP. Sunday Game winner, Jimmy Browne net 50, R/up Rory Homan Net 51. Three ball scramble winners, Martin Cullen, Rory Homan & Bernie O’Driscoll G47. R/up Noel Dunne & Bridget Murray G49. Congratulations to Bernie O’Driscoll with a hole in one on the 11th. Wednesday scramble winners Noel Dunne, Rory Homan & Patricia Delaney G61 a course record for 27holes. Sunday game winner Bridget Murray Net 48, R/up Josie Cahill Net 51. Wednesday scramble winners Noel Dunne, Rory Homan & Nick Mulvany. Navan away day next Sat 19th Aug. Meet at the clubhouse for lifts. Tee time 2pm for scramble followed by singles. Presentations and dinner in Naval Club following the games. Sunday game winner Tommy McCann Net 48, R/up Liam O’Rourke Net 51. Scramble winners Noel Dunne, Patricia Delaney & Mary O'Sullivan. Congratulations to Martin Cullen with a hole in one on the 17th. Navan away day Sat 19th Aug meet at clubhouse at 1pm for lifts. July LOTTO Bonus Ball winners, Maura Lynch #20 €100, Plus 1 Tommy McCann #23 €20, Plus 2 Noel Dunne #38 €15. Sunday game winner Breda Finnegan net 47, R/up Tommy McCann Net 51[ob9]. The Walker Cup Golf Challenge Cup winners Ronnie Delaney, Nick Savage, Bridget Murray & Eoin Walsh G59 [ob9] from R/up Noel Dunne, Seamus Dunphy & Patricia Delaney. Ladies; Pearl Grogan Cup, league scramble starting Tues 1st Aug 7pm. July LOTTO bonus ball winners, #20 Maura Lynch, Plus1 #23 Tommy McCann, Plus2 #38 Noel Dunne. Sunday game winner Jimmy Browne Net 51, R/up Rory Homan net 52. The annual Walker Cup, Golf Challenge takes place this Wed 26th July at the Balheary Par 3 Golf Course Tee 5pm. Local golfers and visitors are welcome to come along and play contact the sec on 085-1743748. Any persons interested in playing P&P can contact the secretary on 085-1743748 for more details of membership for 2017. Sunday game Winner, Tommy McCann Net53, R/up John Fitzpatrick Net 54 [ob6]. Wednesday scramble winners Noel Dunne, Nick Savage & Josie Cahill. Congratulations to Patricia Delaney with a hole in one on the 17th. The annual Walker Cup, Golf Challenge takes place on Wed 26th July at the Balheary Par 3 Golf Course Tee 5pm. Local golfers and visitors are welcome to come along and play contact the sec on 085-1743748. Sunday Game winner, Nick Savage & Josie Cahill net 51 drawn game after back counts. Sunday 2nd July Game winner Nick Savage Net 48, R/up Tommy McCann net50. Wednesday Pairs Scramble winners Ronnie Delaney & Bridget Murray Net 47. Any persons interested in playing P&P can contact the secretary on 085-1743748 for more details of membership for 2017. Closing date for 2017 membership is June. June LOTTO Bonus Ball winners, John Travers #19 €100, Plus 1 John Fitzpatrick #29 €20, Plus 2 Trish Cox #2 €15. Continental weather across the country as we baked in 24+ degrees of sunshine over the weekend and the hottest Sunday morning of the year. It may have been father’s day all over the country but the ladies in the Ballyboughal P&P club were not letting the gents have their glory today. Sunday game winner Mary O’Sullivan Net 48, R/up Joan Homan Net 49, well done to Mary on this her first singles win. Wednesday scramble winners Noel Dunne, Tommy McCann & Mary Kennedy. Congratulations to Nick Savage with a hole in one on the 5th index 1. The Jack Fitzsimons Club Major was a very close contested game with one stroke separating the top six players. Winner Trish Cox Net 51 [ob9] from R/Up Seamus Dunphy. Nearest the pin on the day at 3rd Patricia Delaney. Sunday three ball winners Jimmy Browne, Nick Savage & Trish Cox. Wednesday scramble winners Martin Cullen & Mary O’Sullivan. Next Sunday 11th June Club major Jack Fitzsimons prize tee 11am. Superb perfect conditions for golf after the rain monsoon of Saturday set up the Sunday game for some great scoring opportunities. Sunday Game winner with a fabulous Net 46, Trish Cox, R/up Ronnie Delaney Net 47. Wednesday Scramble winners Rory Homan & Bridget Murray. LOTTO bonus ball for May #29 Mary Kennedy, Plus1 #39 Breda Finnegan and Plus2 #22 Marie Delaney. Sunday game winner Bridget Murray Net 47, R/up Josie Cahill Net 50[ob9]. Scramble winners Ronnie Delaney & Nick Savage. The 2017 AGM takes place Wed 24th May at 9pm in St Patricks Hall Ballyboughal. Any persons interested in playing P&P can contact the secretary on 085-1743748 for more details of membership for 2017. Existing members are reminded that renewals are now due for 2017. The third club major of 2017 was closely contested on a bright sunny blusterly morning with a great turnout on the day. 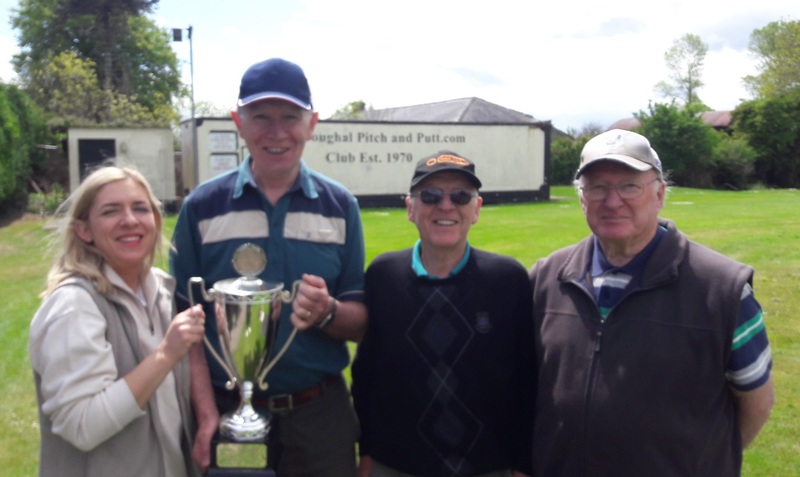 Chairperson Mary Kennedy Presenting the Mulvany Cup to Kieran Warren , with R/up Pat Bonass and nearest the pin on the day Rory Homan. Mulvany Cup winner Kieran Warren with a net 48, R/up Pat Bonass Net 49. Nearest the pin on the 8th Rory Homan. Congratulations to Kieran with this his first club major win. Wednesday scramble winners Jimmy Browne, Nick Savage and Marie Delaney. The Wednesday scramble is 7pm. Sunday game winner Noel Dunne net 50, R/up Eddie Madden Net 52 [ob9]. Congratulations to Ronnie Delaney with a hole in one on the 7th. The 3rd Club Major of 2017 The Mulvaney Cup takes place next Sunday 14th May Tee 11am. The Wednesday scramble moves to the evening at 7pm from this Wed 10th May. Wednesday scramble at 3pm great for beginners and improving your game also a good day for interested persons to come along and have an introduction to the club. April LOTTO Bonus Ball winner Anne Ryan #47, Plus1 Breda Finnegan #39 , Plus2 Nick Savage #44. Sunday game winner Nick Savage Net 51, R/up Breda Finnegan Net 52[ob9] from Trish Cox. The Easter Major at the club produced some great play on what was a very breezy day with little light showers making the conditions very challenging. Many thanks to Sean and Orla Gannon of Gerrardstown Stud for their kind sponsorship of the Easter prizes, ‘very yummy indeed’. The Easter winner Breda Finnegan Net 45, R/up Trish Cox Net 48[ob9] from Patricia Delaney. Nearest the pin on the day was Noel Dunne. Breezy conditions on a bright April morning making the course a little more challenging this week. Sunday game winner Ronnie Delaney Net 53[ob9] R/up Joan Homan. Congratulations to Ronnie with a hole in one 13th. The Easter Major kindly sponsored by Gerrardstown Stud takes place next Good Friday Tee 4pm. Wednesday scramble continues this week at 3pm great for beginners and improving your game.